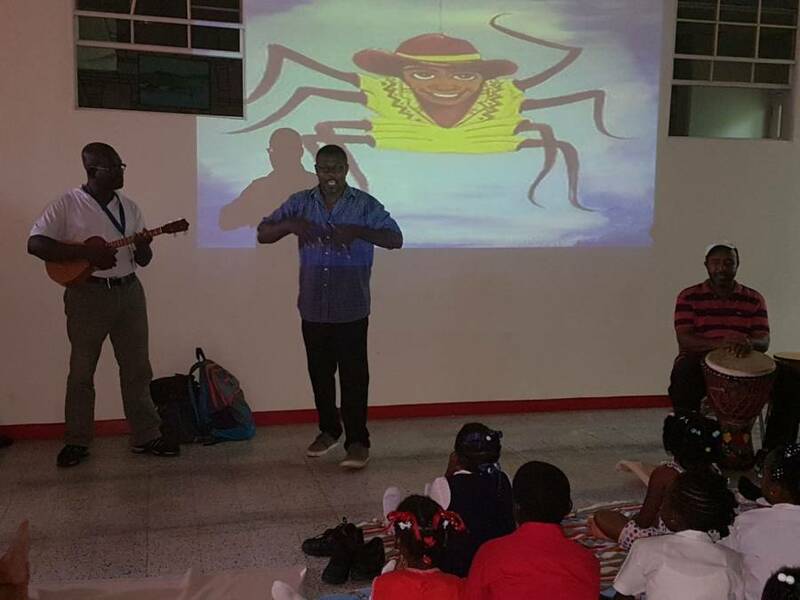 The Venezuelan Institute for Culture and Cooperation in collaboration with La Boucan Creative Centre hosted part 1 of 2 series of a traditional evening featuring Anansi tales and other traditional stories and songs. La Boucan is a local creative arts institution whose objective is also in line with the Venezuelan Institute’s as far as keeping our historical literary and oral heritage alive. The activity was initiated and carried out based on the Institute’s objective of cultural exchange between the two countries and maintaining history and cultural practices. Anansi, or Compere Zien (Za-yeh) as traditionally known, is recognised for his cunning and tricky ways. Anansi originates in West Africa – Ghana to be exact and he frequently takes the form of a spider. He holds the knowledge of every folktale and story; and uses his cunningness and intelligence to try to get what he wants. It is thought that Anansi was originally found in stories from the Ashanti and then the Akan people in Ghana, and for them, Anansi is the god who webbed the entire world. Anansi stories came to the Caribbean during the Atlantic slave trade; the stories crossed the ocean with the slaves through oral tradition. Traditionally, these stories were told by elders to pass down knowledge and moral messages to the younger generations. Sometimes the stories were acted out by the storyteller, or even sung with dancing and drumming. The 31 May activity endeavoured to recreate a traditional setting of this nature, where our young participants were exposed to various Anansi stories and other folktales, and where our adult participants were able to relive a tradition that has long been forgotten. Francis Urias Peters, well-known Playwright and Director at La Boucan Creative Centre, Montieth Drayton, talented drummer and leader of the group Kapab, as well as Bassanio Nicholas, well-known comedian and also a student at the Venezuelan Institute, gave the audience an absolute treat. They performed stories about Compere Zien and the Pig, Compere Zien and his deal with the devil, Ya Mini Mini among others, accompanied by drumming and songs such as Island Day with the Heel and Toe dance, Tom Gone Away, and many others. The Venezuelan Institute for Culture and Cooperation will continue its efforts to promote cultural and historical appreciation and welcome collaboration in the same.